Although the camping-trip fell through, we got to get out both Saturday and Sunday afternoon. And both afternoons were so totally opposed to each other. Saturday afternoon we decided to take a trip to Biloxi, to see how they had fared and recovered from Katrina. I know many areas are still suffering and trying to recover and clean up after that hurricane, but to see it with my own eyes left me speechless. The devastation is still enormous. Heaps and heaps of debri are everywhere, even with the clean-up at full speed. The beach closed down, still covered with what the wind decided to dump there. But what was most shocking of all, was seeing those bare concrete foundations and half demolished but still standing houses that once were someone's home. It was very disturbing and made me so sad to see all that. I pray those people have or will have a home again soon and that God blessed them not to have lost a loved one. Material things can be replaced, but a life can not. Sunday afternoon Kc and I went to the park with a loaf of bread to feed the ducks. It was chilly but sunny and we found a good spot with lots of hungry ducks, coming up to us as soon as they spotted food and acted like they were starving (no, they are not but we fell for it!! haha). They gathered all around us and one who thought he was being treated unfairly, pecked my leg twice to get attention and have his share. Which of course he did:-) I had my back turned to Kc while we were feeding them, when I heard him burst out in laughter. He told me to look at the two white ducks in front of him. Kc held a piece of bread, high enough where it was just out of one of the duck's reach. And the duck jumped up to try and get it. 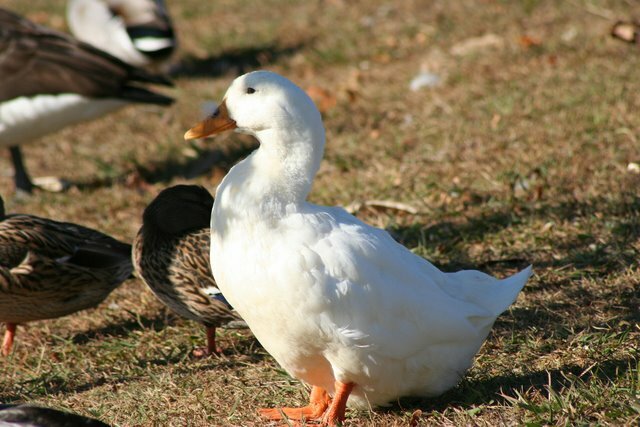 Now picture this duck, with it's tiny little legs, jumping! He hardly could jump up an inch and it was hilarious to watch him. Don't worry, we didn't tease them too long, haha. Afterwards, we sat down in the grass, surrounded by ducks and simply enjoyed. Even though both days were so totally different, I was grateful. Grateful God had spared us during the hurricanes an blessed us with a home and all we had, and grateful for all the joys He gives us, with and in Him, each other and all He created. May I always be mindful of God's blessings and Wonders. Sounds like a great time. I'm glad you enjoyed it. Hopefully, you will be able to go on that camping trip this weekend! I am so grateful you are feeling better. I pray it will continue. Corry, I love to take old bread and feed the ducks! I don't do it nearly often enough. Thanks for encouraging us that we need to be aware of God's hand in everything. Neither do we:-)I love it too. I tend to forget that way too often! glad you enjoyed it. lookig forward to having one of those simple but fun trips very soon. This one was impatient as well but he didn't bite, just kinda poked my leg to get the attention. I can imagine though they can bite really hard. I hope your sister didn't develop a goose-foby! Aww, I hope you will have one soon as well. Great that you had a great time Corry. Today is my first year blogging anniversary. Just wanted to say thanks for being my blogging buddy. Your family is very blessed with you, just like all of us! Love you both, Kitty and Audrey. God bless you!